Neighbours handyman Kyle Canning will be reunited with his long-lost father Gary in an upcoming storyline, Digital Spy can reveal. The soap has already filmed a guest stint for the new character, who will turn up in Erinsborough and shake up life for the popular Canning family. As Kyle hasn't seen his dad for 16 years, he will experience mixed emotions when he discovers that Gary is back. Christopher Milligan, who plays Kyle, told Digital Spy: "The good thing about Gary is that he is Sheila's son, Naomi's brother and Kyle's dad, so he can be involved with everyone. It was very interesting for the weeks that he was with us, and I'm really looking forward to seeing the episodes myself. "Gary left when Kyle was 8 and he has never spoken to him or seen him since. That was 16 years ago. At first Kyle doesn't quite know whether to hit him or hug him! "Kyle has really wanted his dad to come back and be part of his life for so long, but when he does, he doesn't know how he is feeling or how to react with his emotions. It's going to be a bit of a shake-up, but hopefully it works out for them!" Asked about the actor who is playing Gary, Milligan replied: "I can't reveal his name, but he's phenomenal and one of the best actors that I've ever worked with. "He's so funny and with the way that he portrays Kyle's dad, you can really tell where Kyle gets his bogan and larrikin attitude from! You can really see the history between them even though Gary hasn't really been around." any picture of daddy canning? 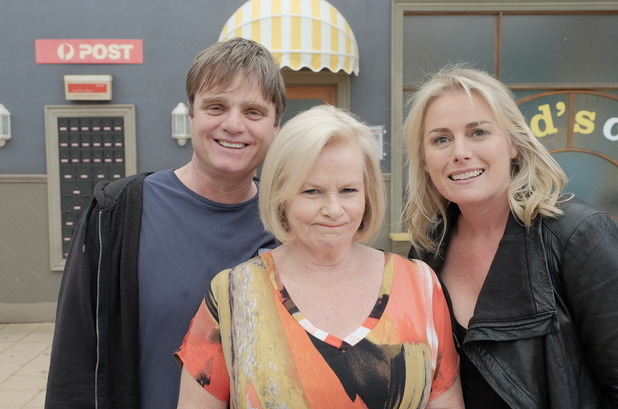 Neighbours bosses have released the first picture of newcomer Gary Canning with his on-screen family. As previously revealed, Gary is the estranged father of Kyle and son of Sheila, who will be joining Ramsay Street for a guest stint. Actor Damien Richardson has landed the role of Gary and will make his first appearance next week on Australian screens. Gary's arrival will be screened in the UK on November 21. Christopher Milligan, who plays Kyle, recently told Digital Spy that his popular character will be shocked to be reunited with Gary for the first time in 16 years. He explained: "The good thing about Gary is that he is Sheila's son, Naomi's brother and Kyle's dad, so he can be involved with everyone. It was very interesting for the weeks that he was with us, and I'm really looking forward to seeing the episodes myself. "Gary left when Kyle was 8 and he has never spoken to him or seen him since. That was 16 years ago. At first Kyle doesn't quite know whether to hit him or hug him!" The actor added: "Kyle has really wanted his dad to come back and be part of his life for so long, but when he does, he doesn't know how he is feeling or how to react with his emotions. It's going to be a bit of a shake-up, but hopefully it works out for them!" 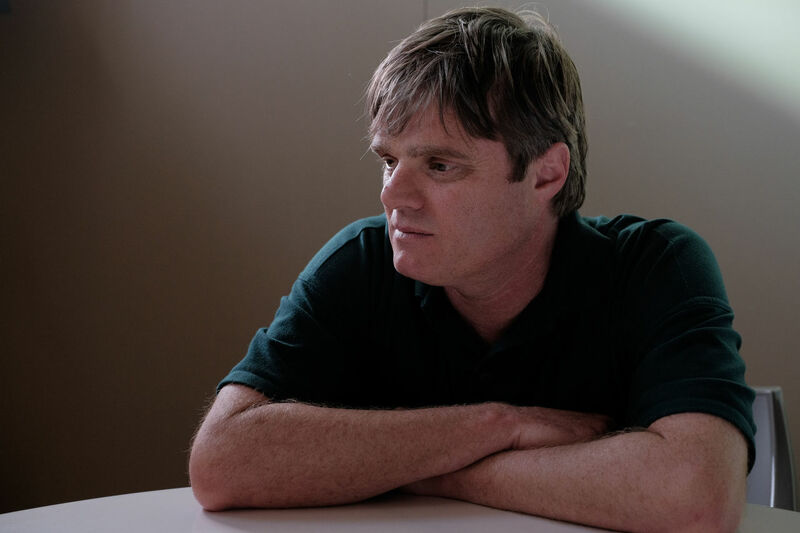 Neighbours handyman Kyle Canning will confront his estranged father Gary later this month following the discovery that Sheila has been in contact with him. Kyle (Christopher Milligan) gets the shock of his life when he discovers his grandmother Sheila (Colette Mann) has secretly met up with her son Gary. Reeling in the wake of seeing Sheila with his father, Kyle doesn't know how to process the shock and refuses to discuss the situation with Sheila. After being urged by Georgia to push Sheila for answers, Kyle is devastated to learn that Gary has chosen not to be in his life for all these years. Kyle is furious with Gary. Witnessing Kyle's hurt, Georgia confronts Gary herself and pleads with him to reach out to Kyle, who is longing for his attention. With this in mind, Gary decides to take Georgia's pleas on board, leaving Kyle confused by his sudden desire to get to know him. As the pair eventually share an awkward conversation, Kyle's repressed anger towards his father begins to surface but they agree to talk things through later. However, Gary is overwhelmed when he witnesses a tender moment between Kyle and Bossy and decides to cancel his meeting with Kyle, leaving him furious. 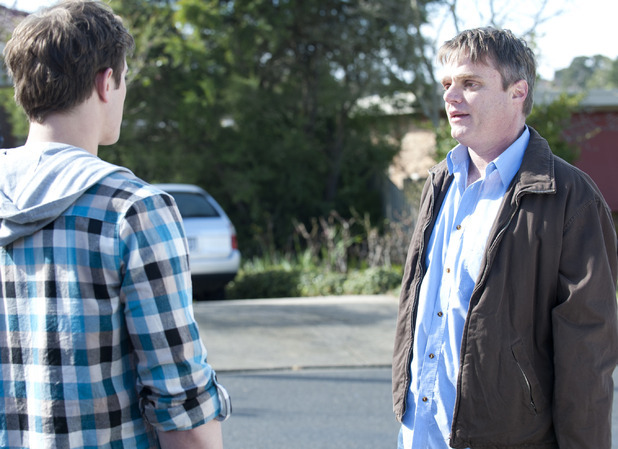 Going after his father, Kyle confronts him in the street but is stunned when he realises just how upset Gary really is. Gary explains that Kyle is a good man, and that he can't take the credit for any of it seeing as he wasn't around. Deciding to leave Ramsay Street, Sheila is left wondering if she will ever see him again, but has he gone for good? 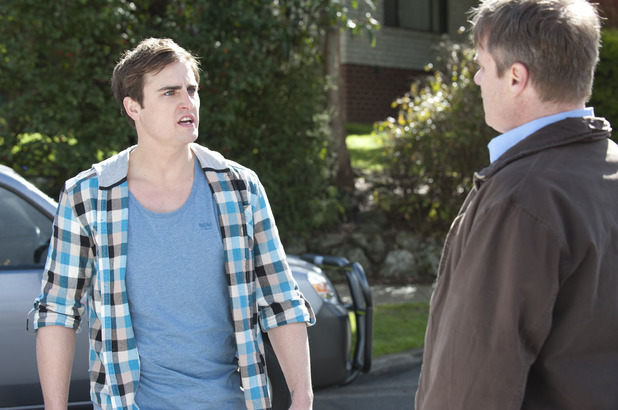 Neighbours airs these scenes on Tuesday, November 25 at 1.45pm and 5.30pm on Channel 5. It looks like there could be more drama in store for Neighbours' Sheila Canning as her troublesome son Gary is set to make a return. Damien Richardson has reprised the role for another guest stint and has been back filming with the soap this week. 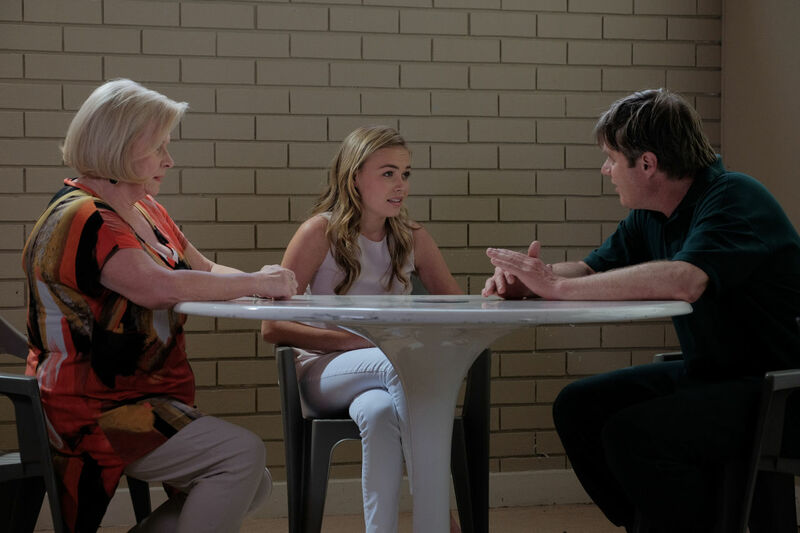 Fans were introduced to Gary - who is also the father of Kyle - last year, but the Canning family reunion was short-lived as his crimes soon caught up with him. Although Gary is currently serving time in prison, he will be making his way back to Ramsay Street next year. However, whether he has changed his criminal ways remains to be seen. Colette Mann, who plays Sheila, recently hinted at the news while speaking to Digital Spy, as well as confirming that a new Canning would be arriving. She said: "A new Canning has arrived on set, but we're not allowed to say who it is. That starts a big new storyline. "An older Canning is also arriving back early next year, so we'll be quite the big family again." Mann is currently directing a stage production of Frankie and Johnny in the Clair de Lune, in which Richardson will star alongside Kate Kendall, who plays Lauren Turner. The play is set to kick off in Melbourne in November. 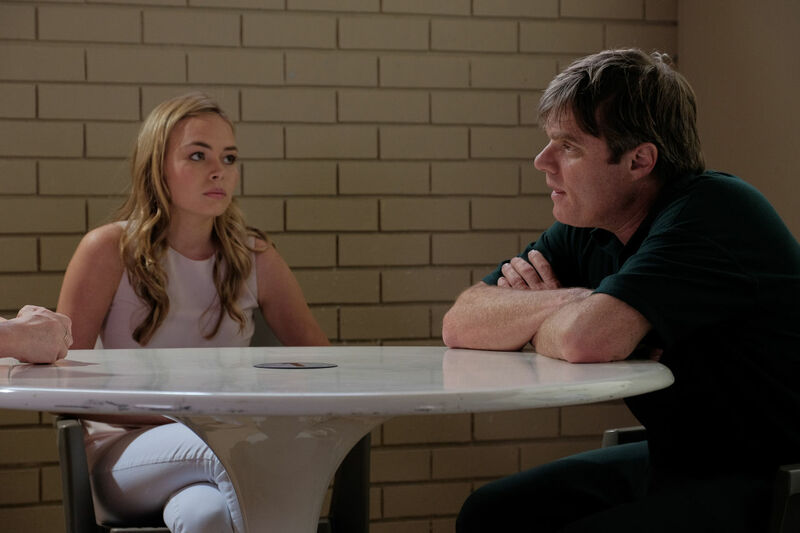 Neighbours reintroduces Gary Canning later this month as his daughter Xanthe pays a bittersweet visit to him in prison. Gary's mum Sheila arranges the meeting as she believes that it'll be good for Xanthe (Lilly Van der Meer), but the family reunion has the potential to cause more harm than good. Xanthe is delighted to see her dad and is especially pleased when he reveals that he may be getting out of prison soon. Unfortunately, Gary's son Kyle isn't as enthused by the news - and that's where the trouble starts. Fearing that it'll cause too much trouble if Gary (Damien Richardson) gets involved in Xanthe's life only to later let her down, Kyle pays his own visit to the prison and warns him off. Kyle urges Gary to see that it'd be better if he just stayed away, so Gary later gets into a fight in order to purposely scupper his own parole chances. 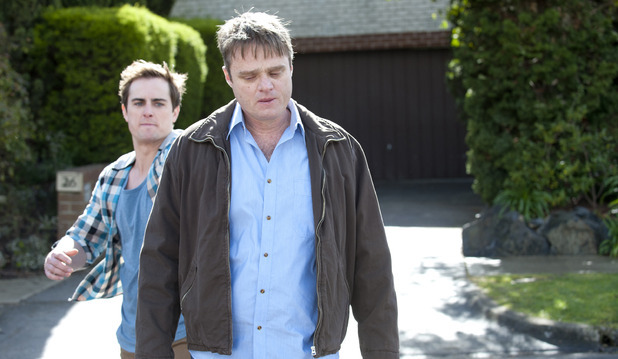 Neighbours airs these scenes on Monday, February 15 at 1.45pm and 5.30pm on Channel 5.